Transformation needs to be export led, so it might be tempting to think only about the needs of exporters. It might be tempting to see growth with very few new, export sector jobs as a failure. However, even in the most successful manufacturing-led transformatory growth episodes, most of the jobs and lots of the output are in non-tradeable sectors. Non-tradeable enterprises are easy prey for “powerbrokers” (Pritchett et al 2017) and extractive institutions. If there are conditions which are imposing huge costs on non-tradeable producers, employment and competitiveness both suffer, so an open environment for these enterprises is good for the whole economy. Being a low-income country in the twenty first century suggests there is something very wrong with economic incentives that has lasted a long time. Being a low-income country almost always means having a large share of the population in low productivity agriculture with little or no marketed surplus, and little purchasing power in the domestic market. It isn’t possible to stop being a low-income country just by having a richer subsistence agricultural sector. A major shift in income levels requires investment in production that meets demand, implying that in a low-income country it needs to be export led. Some aspect of the old set of economic incentives needs to change to initiate this investment, and rewards need to overtake costs and risks from an investor’s perspective. 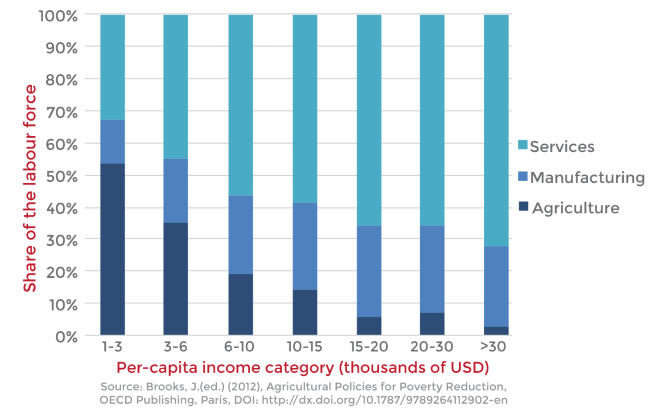 The transition to middle-income status implies a tenfold increase in GDP per capita – it also requires a structural transformation in which the majority of rural, agrarian workers become urban, non-agricultural workers. Export led growth in low-income countries means exports of primary products (agricultural or mined) and/or exports of manufactured goods (including adding value to unfinished goods as part of a global manufacturing process). Big productivity gains in any of these broad sectors can induce rapid investment and growth. Increasing returns can create sustained bursts of growth. Non-tradeables are the principal way labour is absorbed from low productivity agriculture, and therefore the source of most of the jobs in LIC-MIC transitions. It is relatively easy to use regulation and informal coercion to extract rents from non-tradeable sectors that do not take international prices – this however, pushes up prices and costs for the consumers of non-tradeables. Distortions that produce costs in non-tradeable sectors not only reduces investment in those sectors, but also passes on costs to tradeable producers, making them less competitive. If this is true, there are important implications for policy approaches which focus very strongly on potential export sectors. An exclusive focus on bringing down costs for export sectors in an economy where there are very significant excess costs in non-tradeables might draw in less investment for export production than otherwise, with a low multiplier effect and with low levels of employment outside traditional sectors. There is an obvious reason why non-tradeable sectors absorb most labour in episodes of transformatory growth. Because of high productivity, capital-intensive sectors like mining and manufacturing use much less labour per unit output as compared to the domestic market facing service sector. Therefore, an investment in oil extraction might generate great returns, rents, and a substantial contribution to output, but few jobs. Similarly, burgeoning investment in garment manufacturing might generate great returns and profits, a substantial contribution to national output, but a much lesser contribution to national employment (due to high labour productivity). Historically this was not the case. In 19th century Britain, labour had shifted from agriculture to services and manufacturing employed 36-39% of the workforce between 1841 and 1961. 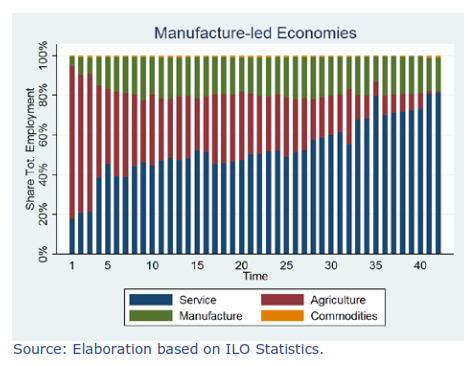 Today, however, even the most successful low-income manufacturers show an employment pattern dominated by a shift from agriculture to non-tradeable services. This includes Bangladesh, where, between 1990 and 2010, 24% of the workforce shifted out of agriculture but only 4% of those transferred to industry: total employment in the garment industry is 8% of the workforce. China exhibited a similar trend, where between 1990 and 2010, 32% of the workforce left agriculture but only 8% of those transferred to industry. Manufacturing employment in China reached 15% of the workforce in 2012 (compared to 39% in Britain 100 years earlier). In “Deals and Development”, (Pritchett et al. 2017) call manufacturing exporters ‘miracle workers’ whereas non-tradeable firms are either ‘workhorses’ or ‘powerbrokers’ in the ‘rent space’. This is a framework for thinking about where rents arise in a particular economy. True, in an economy where rents are extracted from producers by means of taxation, regulation or corruption, it is pretty miraculous to be able to run an export competitive manufacturing enterprise – because of competitive international markets, exporters cannot pass on excessive rent costs to their customers. In non-tradeable sectors, ‘powerbrokers’ use connections to create market power and rents they can hold onto, whereas ‘workhorses’ endure excessive costs and risks to generate rents for others. Both can pass on the costs of rent to consumers. We can see specific examples of rent extraction in the non-tradeable sectors. A great example was the holdings of Ben Ali’s kinship group in Tunisia (Rijkers et al. 2012), which were concentrated in regulated, non-tradeable sectors like telecommunications and real estate, and were seven times as profitable as the average enterprises in Tunisia. Another example is African freight hauliers (Teravaninthorn and Raballand 2009) – freight transport costs in Africa are generally high and are highest where ownership of the industry is most closed to competition. Extraordinarily, the standard of transport infrastructure has almost nothing to do with freight transport costs. 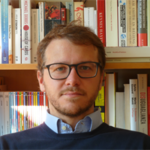 Vanino and Lee (2017) compared measures of good governance (and the potential for rent extraction) with the relative prices of non-tradeable goods in lower and lower middle-income countries (LMICs) and found a strong correlation between improving governance scores and falling relative prices of non-tradeables. An increase of 1% in the quality of governance in LMICs is associated with a reduction by almost 7.5% of the relative price of non-tradeables. Rising relative prices for non-tradeables is equivalent to falling competitiveness, and many non-tradeables should be really low cost in low-income countries. They are produced with low waged labour and, on average, low capital intensity. Clearly, power, water, and transport are more capital-intensive. In “Breaking into Tradeables”, Venables (2017) describes how cities might get locked into non-tradeable specialisation, including with an urban form that suits high-cost non-tradeable production but not competitive manufacturing, and he also describes the impact of high-cost non-tradeables themselves on the nominal urban wage. Services can survive with high nominal wages, high input costs, and congestion costs in a “consumption city”, whereas these costs prevent tradeable sectors from being competitive and profitable. Vanino and Lee (2017) looked at input-output data to reveal that non-tradeable inputs directly account for 15-25% of production costs in most tradeable sectors except for agriculture and fishing, with urban wages accounting for a further 8-17%.The conclusion was that a neglected and high cost non-tradeable sector could push significant costs onto tradeable production and undermine competitiveness and investment. Pritchett, L, K Sen and E Werker (2018), “Deals and Development: The Political Dynamics of Growth Episodes Edited by Lant Pritchett”. Oxford Unversity Press. Rijkers, B, C Freund and A Nucifora (2014), “The Perils of Industrial Policy: Evidence from Tunisia”, pp. 1–32, Technical Report, Mimeo, The World Bank. Teravaninthorn, S and G Raballand (2009), “Transport Prices and Costs in Africa: A Review of the Main International Corridors“, World Bank Publications, 772. Vanino, E (2015), “Employment and Productivity Patterns in High-Growth Economies”, October. Vanino, E and S Lee (2017), “Non-Tradeables and Inclusive Growth” OPM Working Paper. Venables, A J (2017), “Breaking into Tradables: Urban Form and Urban Function in a Developing City”, Journal of Urban Economics 98: pp. 88–97.